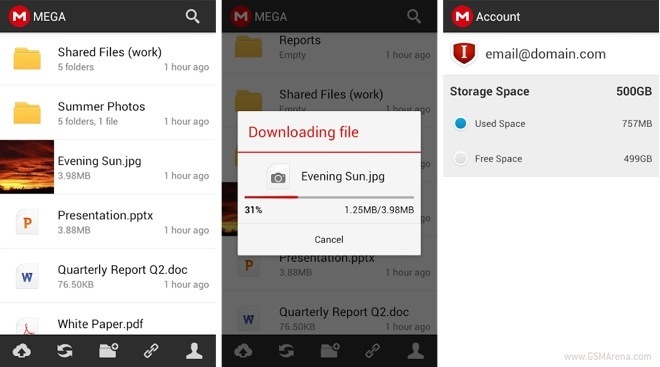 Kim Dotcom’s file hosting service MEGA now has an official app for Android called, well, MEGA. The app isn’t new per se – MEGA just acquired one of the top third party apps, which is a wise move instead of developing your own app. The MEGA app should be familiar to those who have used apps for other file hosting services before. You can manage your account, create folders, upload and download files, move, rename or delete them, search for them or even share them. There is also a camera sync feature that automatically uploads your camera images to your MEGA account. The MEGA app is free and you can get it from here.